← How about Higgs particle instead of Higgs boson? Most people on the planet will hear sometime today that scientists at CERN, the particle physics laboratory in Switzerland, have announced the discovery of a new particle, almost certainly the Higgs boson. ‘Discovery’ is shorthand for 99% confidence level, so this is a great result, coming from two independent experiments at CERN. But what does it all mean? Q: How important is the discovery, what does it compare with? It’s not unexpected, but it’s very important. I think it is quite similar to the discovery of the first experimental evidence for atoms by Jean Perrin in 1908 (following a suggestion by the young Einstein). Scientists had long suspected that matter is composed of tiny entities known of atoms but they had never been observed directly. Perrin demonstrated their existence by showing that the random motion of tiny grains of gum in water could be explained in terms of the collisions of the particles with the atoms of the liquid. Q:What exactly is a Higgs boson, is it like an atom? We now know that the atom consists of a minute nucleus, with tiny, sub-atomic particles called electrons orbiting the nucleus. The nucleus itself contains other sub-atomic particles of matter called proton and neutrons, themselves made up of even smaller entities called quarks. The full list of the elementary particles of matter is described by the ‘Standard Model of Particle Physics’, the modern theory of the structure of the atom and the forces that hold it together. The Higgs particle doesn’t live inside the nucleus, it is a ‘messenger particle’ predicted by the Standard Model; while all other particles predicted by the model have been detected in experiments in particle accelerators, the Higgs has remained outstanding until now. Q: And that’s why it’s so important? Not only that. The Higgs is also of central importance in our understanding of the atom. According to the Standard Model, particles acquire mass as a result of their interaction with the Higgs – or to be specific, their interaction with a certain type of quantum field named the Higgs field (after theoretician Peter Higgs of Edinburgh University). The Higgs particle is simply the ‘messenger particle’ associated with this field. Q: Why is it sometimes called the God particle? Most physicists dislike the name, but it is somewhat apt since the field associated with the Higgs particle is thought to endow all other particles with mass. Another reason is that the particle has become something of a Holy Grail in particle physics because it has proved remarkably hard to find over five decades. The discovery of the Higgs boson is an important confirmation that our view of the fundamental structure of matter is on the right track. Q: How was the particle observed? At the LHC, two beams of protons are slammed into each other at extremely high energy. Exotic particles are created out of the energy of collision, just as predicted by Einstein (E = mc2). These unstable bits of matter quickly decay into other particles, including Higgs bosons. The Higgs particles themselves then decay into lighter particles in a number of different ways or ‘decay channels’. These particles are detected at the giant particle detectors attached to the beam at CERN – two independent detectors (ATLAS and CMS) have detected two different decay channels of the Higgs, hence the excitement. Q: How definite are the results? Each group is quoting a sigma level of 5, corresponding to 99% certainty. This certainty reflects that a new particle has been found with mass 125 GeV, consistent with a Higgs. However, further work is required to determine whether the particle has other properties consistent with a Higgs. 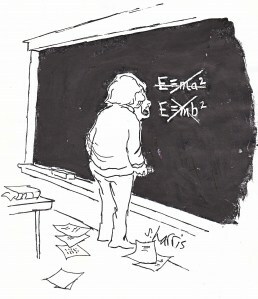 Q: What comes after the Higgs? The Higgs particle closes one chapter, but opens another.This is because the Standard Model is known to be incomplete. The properties of the new particle should give great insights into new physics beyond the Standard Model. For example, evidence of more than one type of Higgs particle would be a strong hint of the existence of a whole new family of particles known as supersymmetric particles. The detection of these particles is an important test for unified field theories, theories that suggest that the four fundamental forces of nature once comprised a single force in the infant universe. Indeed, the next round of experiments should give us many important insights into the very early universe because the high-energy conditions resemble those that existed when our universe was very young. Q: Does the Higgs have a technological application? No. However, the technologies developed in particle experiments find important application in society. A good example is the use of accelerators in modern medicine. Another is the world-wide web, a software platform first developed at CERN in order to allow scientists to share collision data. The latest innovation is the GRID, the networking of thousands of computers worldwide in order to facilitate the analysis of huge amounts of data emerging from the LHC. Today’s result is a great triumph for the GRID, it is quite amazing that the data was analyzed so fast. Q: To wrap up; an exciting discovery? Huge. Expected, but huge. Compares with the discovery of the atom, or putting a man on the moon. The morale of the story is that scientists are like the Mounties – they always get there in the end. Clearer than any other explanation I’ve heard, Cormac. how does higgs particle gets there mass? if it decays in millionth of billionth of billionth of a second then, how it is stable inside the nucleus? Sharath; Yes, all bosons are named after Prof Bose, richly deserved. u mean hole universe floating in higgs field? what about the 1st question. Hi Sharath, yes, we think the ‘ordinary’ particles of matter (fermions) float in a Higgs field, and it is their different interactions with the field that gives them their different masses. The quality of the natural sciences, natural substances, the very essence of the universe, particles, genes, the big bang, black holes, dark matter, particle field, mechanics, the birth of mankind, the end of the universe, super new Department of prehistoric natural history of the solar systemthe origin of genes and particle model of the universe, the quark model, such as elementary particles, the God particle, relativistic and non-relativistic, and so on and so forth. Global natural scientists are constantly emerging, and experimental detection results of exploration and remarkable achievements. Some 62 kinds of particles have been found, various theories and hypotheses, as well as the deepening of experimental detection, human beings trying to find the true meaning of nature – God particle, everything can be all is well. Folks are looking for in the assiduous God particle or better say that the original of nature, heaven-sent man, gods, to mankind a great inspiration and opportunity, God how? The major achievements of physicists and cosmologists, biologists, chemists, not only the God particle detection was observed, but more importantly: experiments and research, detection and discovery, designed to in-depth explanation and revelation of the God particle, a driving force (the association and causal relationship between gravitation and ultrafine particles, field and ultrafine particles of super-spin vector domain “super-spin sub-and super-spin vector domain field, super-rotation power and super-rotation of movement.” experiments and observed an extremely important , without which everything is nonsense, ready to collapse and we will find the specification of the God particle is not standardized, regular or non-being is the God particle evolution and transmutation, etc. In other words, God is not a single particle or lonely existence of the universe particles and super-spin vector domain field and ultra-roton interaction, mutually cause and effect and the Big Bang, dark matter, super-rotation movement of the God particle (ultra-roton) super-rotation movement domain – field physics formulas, physics equations, mathematical equations, as well as human discovery, only the infinite drop of the sea fills the God particle by no means limited to the corner of the limitations of modern scientific instruments, adds to the difficult and errors found. rates are up for a small sample size. To use the player to your favorites. (I also love the theme/design), I don’t have time to read through it all at the moment but I have saved it and also included your RSS feeds, so when I have time I will be back to read a great deal more, Please do keep up the great work. Bring your coat because this place is kept at 20 degrees. a celebration centre, a spa, an individual beach as well as the water park. time that are as below:.